ESPANOLA, N.M. —Surveillance video recently taken at the Espanola police station is a bit freaky. On Saturday Officer Karl Romero was keeping an eye on surveillance cameras around the station when he spotted something in the sally port. A sally port is a controlled gate or passage in a fortified place. Romero said what he saw looked like a ghost walking across the lot, right through cages and a gate. He reported it to his supervisors. Detectives said there is no way in or out of the secured area without the gates opening and an alarm sounding. Police said they hear strange noises and see unexplained images in the lobby of the building, too. 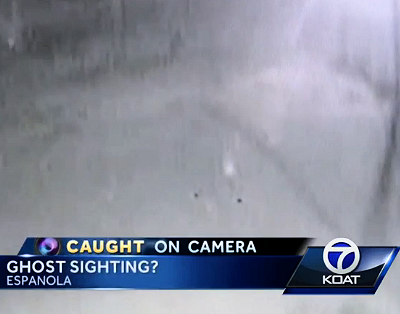 Action 7 News asked Detective Solomon Romero if he thought the image was a ghost. “I do believe in ghosts -- I don’t know (what exactly was on the video), but we’ve had some unsolved murders in the area,” Romero said.